It’s a design that simply oozes technical brilliance and creativity, with everything a modern homeowner could want for an easier lifestyle. And it was about time because the owners of this 24-year-old property hadn’t updated their traditional wooden kitchen since they first moved in just after it was originally built. 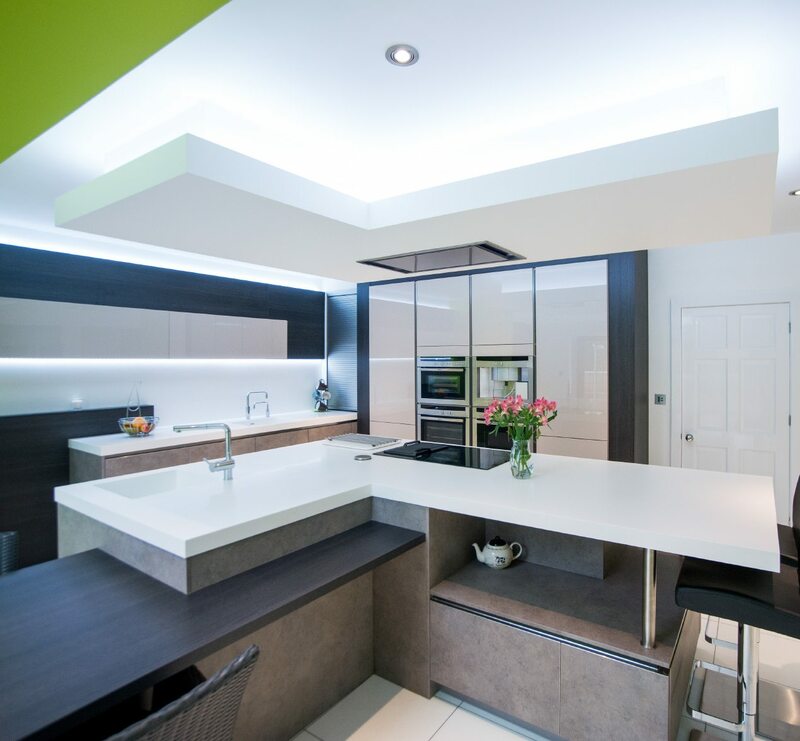 After their close friends recommended Kitchen Design Centre, they soon found themselves in awe of designer Simon’s skill and expertise and couldn’t wait for him to get started. 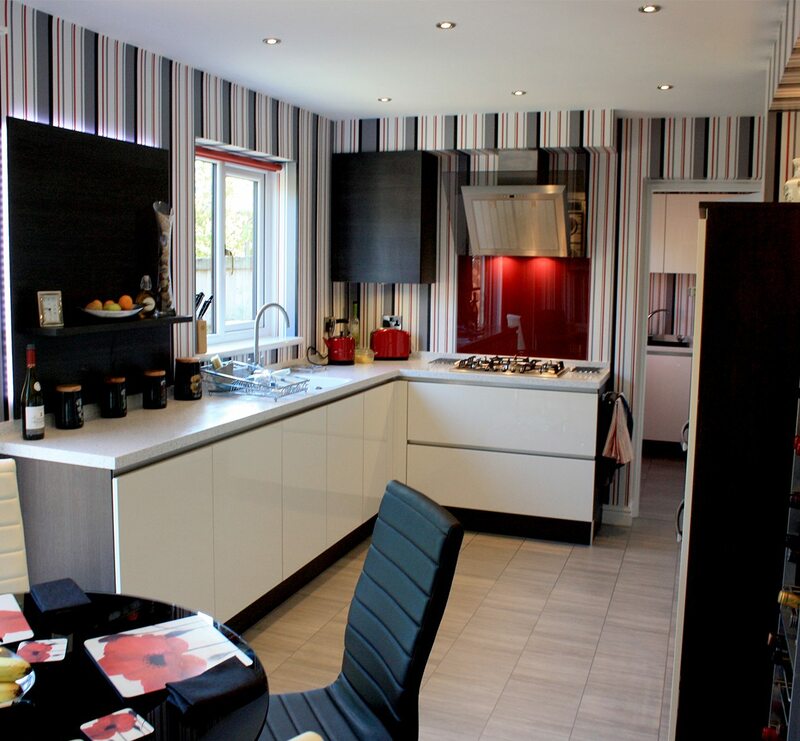 It was one of those rare projects where the designer had free reign because they were happy for Simon, from the Colne showroom, to do whatever he wanted to make this kitchen truly a sight to behold. 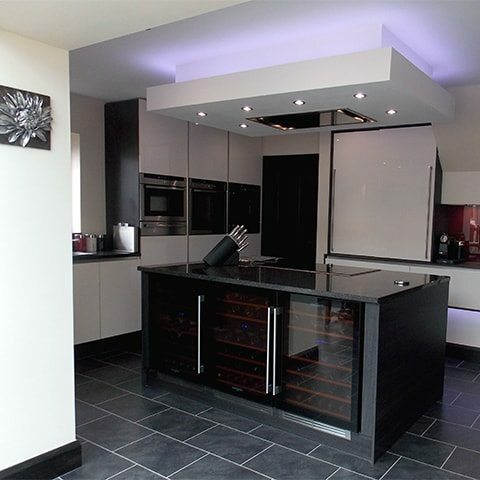 This simple, modern design is incredibly effective – with white cabinets, doors and ceilings combined with a much darker granite worktop and dark flooring. But what makes the room really stand out? It’s an unexpected coloured feature that only a professional with years of experience could envisage working in that context – transparent red glass. 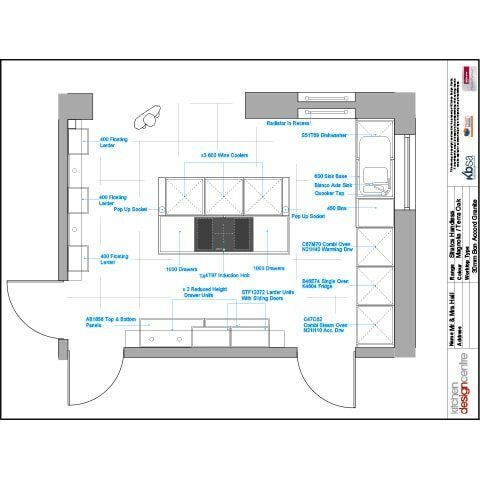 Simon also designed and built a brand new utility room, which blends in seamlessly with the new kitchen design – the old garage was split in half to accommodate the new area. Another great design feature is a completely bespoke designer radiator, indented into the wall to add an exquisite finishing touch to this beautiful and innovative design. 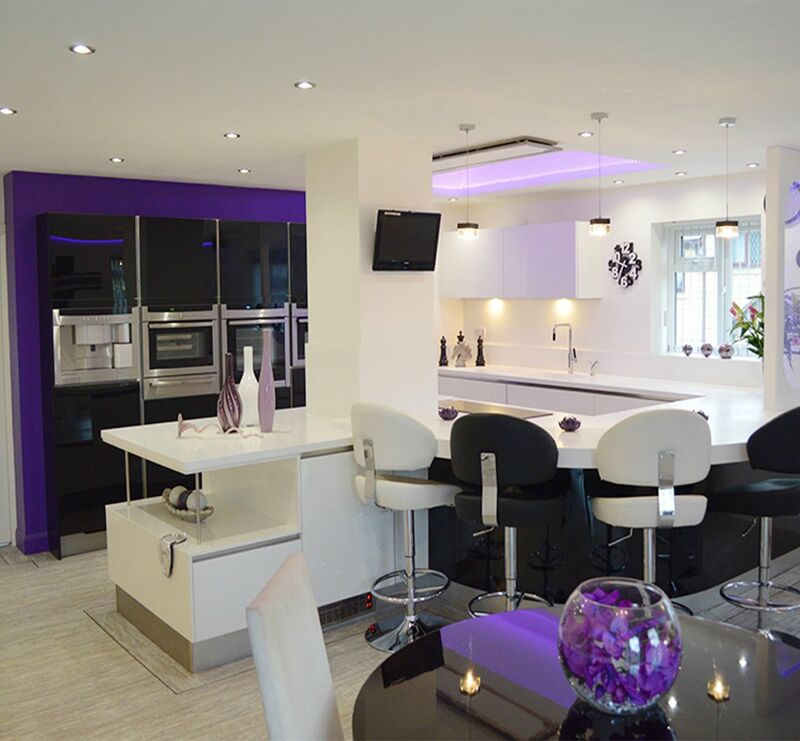 The room is also packed with all the latest state-of-the-art Neff Appliances you can think of – such as four different types of ovens and an induction hob – as well as a Quooker hot boiling water tap and an island extractor. As wine enthusiasts, the couple also asked for a Duel Zone Wine Cooler, which keeps both red and white wine at the correct temperature. The kitchen is designed in such a way that everything is easy-to-reach when in the main cooking area. There’s so much extra storage in the drawers, that it’s almost impossible not to find some extra space for utensils and appliances. “We knew we wanted a room that was very practical, since I am an avid cook,” said one of the homeowners. To top it all off, there are hidden plugs and USB sockets fitted inside the kitchen island that you can pull up to reveal – great if you own an iPad or smartphone. 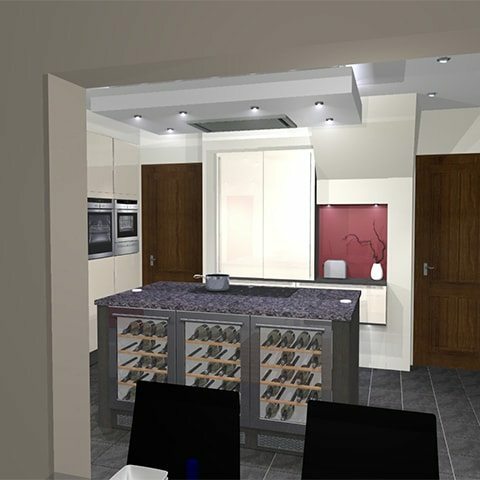 The homeowners were more than impressed with Kitchen Design Centre’s innovation and forward thinking on the project and said they intend to recommend the company to their friends. “It was a long term project, since we wanted to redo the kitchen as well as create a new utility room at the same time – and we knew we had to get it right. 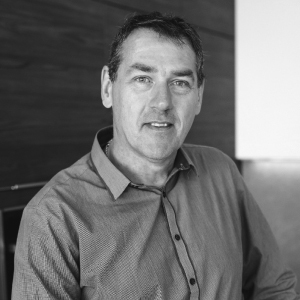 "Initially, we thought about getting another traditional kitchen, but Simon said ‘why don’t you try something a bit different’ and we’re really glad we listened to him." "Deep colours that pack a punch are best used sparingly – which is why the red works so well in a couple of places against the white and black."